The bean leaf beetle, Ceratoma trifucata, is one of the most serious pests of commercial soybeans. It is an occasional pest of snap beans, soybeans and other similar crops in the home vegetable garden. Adult bean leaf beetles prefer tender young plant tissue and they can cause significant damage by defoliating and killing young plants. Older plants will be less vigorous and have decreased yields. Feeding damage to leaves appears as approximately 1/8 inch diameter round holes between major veins. (Grasshoppers or caterpillars cause larger irregular holes or jagged leaf margins; flea beetles cause smaller holes.) There may also be chewing damage on the pods. While this damage may cause complete pod loss or spread disease in commercial soybeans, it is generally just cosmetic in home gardens. 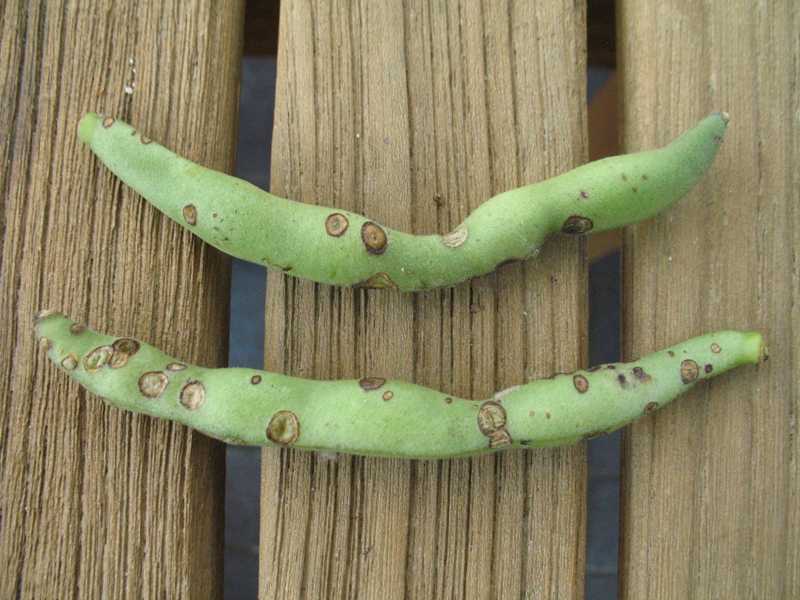 Although the damage caused by the larvae is less severe, they feed on bean roots, especially the root nodules, decreasing the plant’s ability to fix nitrogen. Bean leaf beetle adults are about ¼ inch long and are commonly greenish yellow to tan with 4 black spots. However, they may also be red, orange, or gray with spots, stripes, both or none. They are distinguished from other beetles by the presence of a black triangle at the top of their wing covers. The beetles overwinter as adults in leaf litter and become active in spring when the temperatures reach 50 to 55 degrees F. The females lay 130 to 200 reddish oval eggs in the upper 5 inches of the soil at the base of plant stems. The larvae, which are white with a black head, emerge in 5-7 days and feed on underground plant parts for 3 to 6 weeks. After a pupal stage of about one week, the adults emerge and begin to eat, mate and lay eggs. In Missouri, a second generation matures in September and these adults will move to overwintering sites in October. 1. Practice good garden sanitation by removing leaf litter and controlling weeds, especially those in the legume family. 2. Plant beans later in spring to avoid adults as they emerge from their overwintering sites. 3. 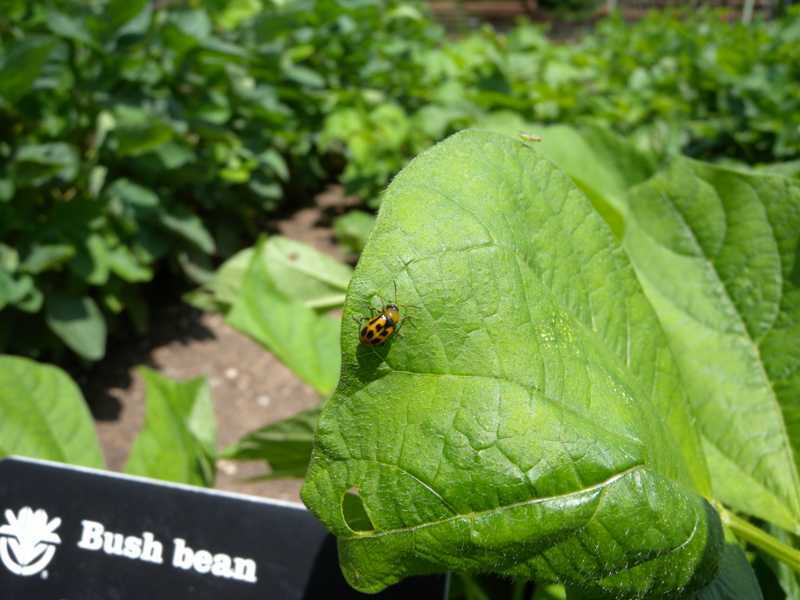 Handpick adults and drop them into a container of soapy water if the bean leaf beetle population is small. Since the beetles tend to tumble off the leaves when disturbed, it may help to hold the container under the plants. 4. Spray with an insecticide. Pesticides such as permethrin is an option. Be sure to use an insecticide that is registered for bean leaf beetles on your crop and follow the directions carefully.